Do you want to have different payment methods on your form? 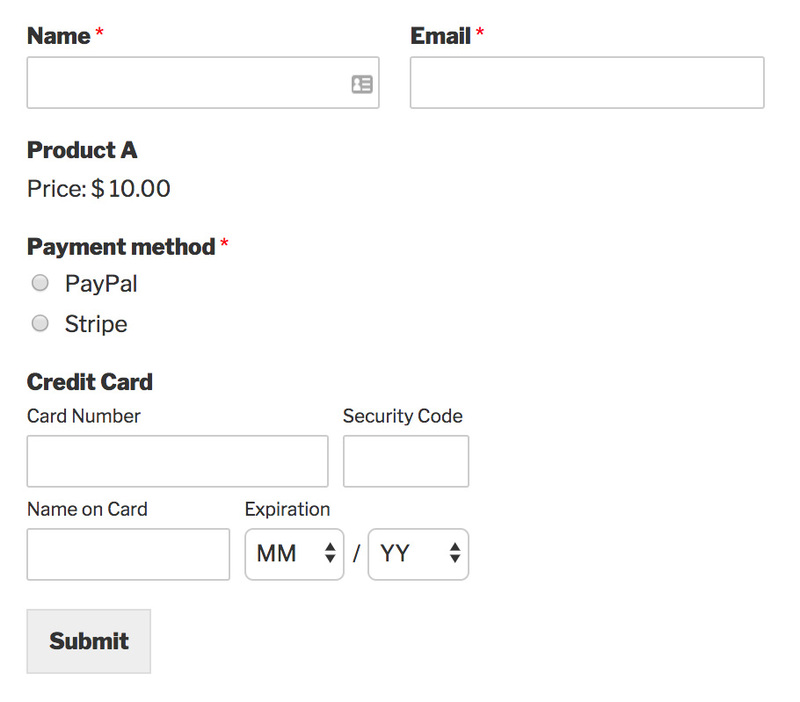 In this article, we’ll show you how to allow your users to choose to pay through either PayPal or Stripe in your forms. Requirements: You’ll need the Pro level license or higher to use the PayPal and Stripe addons. Before we get started, you’ll need to have already installed and activated the PayPal addon and the Stripe addon to use PayPal and Stripe in WPForms. After you’ve added the fields to the form, you’ll need to edit the Multiple Choice field to show the available payment methods on your form. To do this, click on the Multiple Choice field to display the Field Options panel on the left. 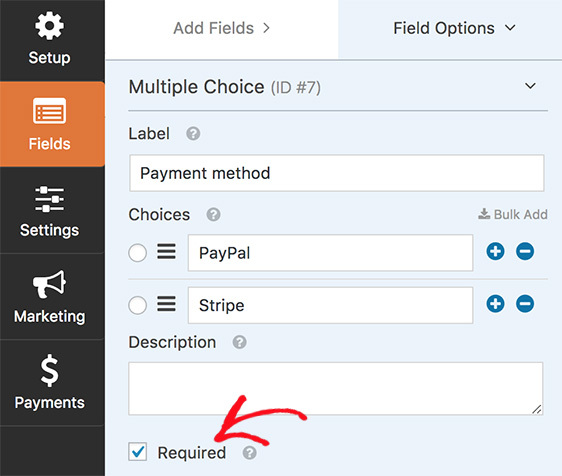 In the Field Options panel, rename the Label to “Payment method” and the options in Choices to “PayPal” and “Stripe”. 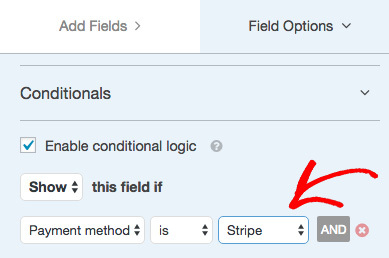 You can delete any unnecessary field under Choices by clicking on the − (minus) button next to it. Also, be sure to set this Payment Method field as Required. Next, you’ll need to apply conditional logic to the Credit Card field, so that it will only be shown to users who have selected Stripe as their payment method. To do this, go to the Field Options panel for the Credit Card field, open the Conditionals section and check the Enable conditional logic option. First, go to Payments tab, click on PayPal Standard option and select Enable PayPal Standard payments in the right panel. Next, scroll down to select Enable conditional logic. Then, set the logic to “Process the payment if Payment method is PayPal“. 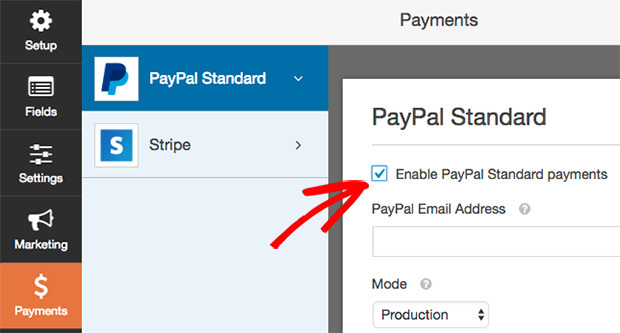 For the complete steps to setup the PayPal addon, check out our full tutorial. 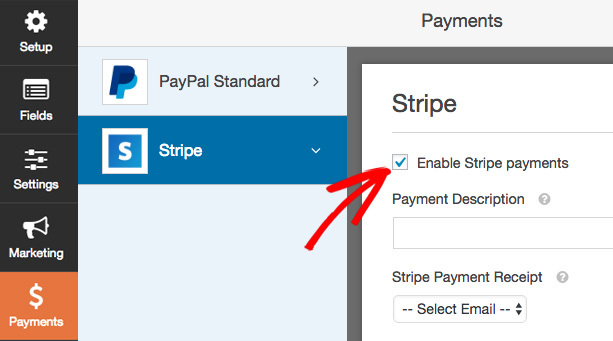 First, select the Stripe option under the Payments tab, and select Enable Stripe Payments. Next, scroll down to select Conditional Logic. Then, set the logic to “Process payment if Payment method is Stripe“. To complete the setup for Stripe in WPForms, be sure to check out this tutorial. That’s it! We hope this guide helped you to learn how to allow users to choose the payment method they prefer. Next, you might want to check out how to access more form templates options in WPForms.